Dan started his career as a policeman rounding up the usual suspects. He continued his career by enlisting in the military, starting out as a lawyer and eventually making his way up to the rank of General. After his retirement from the military, he became owner of a successful tannery. Nixon is now President of the Board of Trustees. Judi brings to the board a fine sense of elegance, as well as years of experience in government as a high-ranking official in British intelligence. When she was younger, "Kate" was well-travelled; several ocean voyages brought her to see much of the world. Mrs. Murdoch is now a successful novelist. Miss Poulain, the youngest member on our board, believes that she has a fabulous destiny with our museum, and is eager to help the world by getting involved. Most recently, Audrey can be found working hard as a cryptologist, hoping to use her love of puzzles and codes in historical research. She specializes in the impact of Italian Renaissance works on the world of art. Mr. Redford joins the board after a long career as a computer security expert. He also brings his experience and government contacts from his work at the Central Intelligence Agency. An esteemed journalist, he has had several articles published in the Washington Post. Jay, after a career in the military, currently resides in his mansion on Long Island. Jamie is a versatile athlete, both as a professional football player and a professional boxer, although he is contemplating a career move into the police force. Mr. Charles is also a talented performer and musician. Mr. Elkins joins our board as a visitor to the United States from London. Michael has experience with high society as a butler, but decided that caring for children was a more rewarding experience. He is currently the director of an orphanage. Cameron started her career as a private detective in a firm that specialized in giving opportunities to women who were being overlooked in the traditional police force. She had a successful career there, and went on to become the owner of a football team. Mrs. Jensen's success has allowed her to pursue her philanthropic interests: in addition to her involvement with the Griffiths Collection, she takes care of mentally disabled children in her spare time. 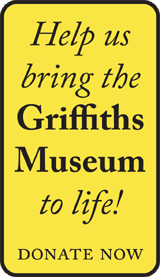 Euphegenia is happy to bring her experience in childcare to the Griffiths Collection, to encourage the Collection to have exhibits that cater to the younger crowd. The board is also happy to have her experience as a transgender advocate. Williams's previous experiences in the gay community as the owner of a successful nightclub in South Beach, Florida have brought him into contact with national political leaders from both sides of the aisle. Dr. Clooney had a successful career as an emergency room doctor. He has also toured as a folk country singer, recording several hit songs. Now retired from both the medical and music professions, Danny spends his retirement collecting rare and valuable art. His talent for getting these pieces from other museums and private collections is unrivalled. Mr. Burbank catapulted to fame as the star of a wildly popular reality television show. Jim used this experience later as fodder for his acclaimed (but controversial) stand up comedy routines. He also brings his experience with tribal masks to the board. George, the oldest member of the board, was a military leader in the African campaign during World War II. General Scott went on to run a military academy, training the future leaders of the US military. Jessica, despite her old age, brings her youthful vigor to the board of the Griffiths Collection. She swims regularly in order to stay fit. In her early career, she achieved renown as an ornithologist. Miss Werthan, currently widowed, lives in the Atlanta area. Dr. Wilder brings his considerable success in business to the Board. His pioneering marketing work in the field of promotional contests brought instant success to his candy company. Frederick is currently a teaching surgeon, following in his family legacy of contributing to the medical community's understanding of life.